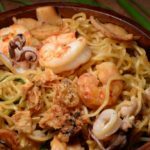 Indonesian Bakmi Goreng is a seafood stir fried noodle dish that is a real treat. This was part of the Tumpeng for our Indonesian meal and to be honest I have made it multiple times since. It can be made with any variety of vegetables and protein. What makes it so outstanding is the combination of the chili sauce, kecap that scrumptious sweet soy sauce and sesame oil. Oh and let’s not forget the fried onions on top adding just the perfect texture. Enjoy it! One of my absolute favorite recipes. It is so versatile, you can use just about any protein or veggies you want. This quick and easy recipe will be one of your favorites too! Place noodles in a deep bowl and cover with boiling water. Allow to stand for 2 – 3 minutes until separated. Drain; set aside. Add chili and soy sauces and sesame oil. Season with salt and pepper. 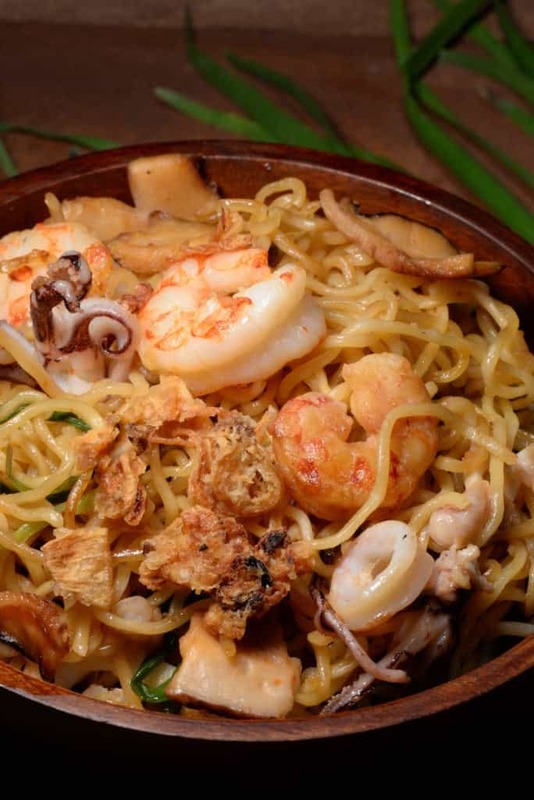 Your bakmi goreng dish is ready to enjoy! Note: You can also garnish the dish with some hard boiled egg.